Dante Exum has been dubbed this year’s international man of mystery, an Australian guard who is known to many by his online highlights and little else. 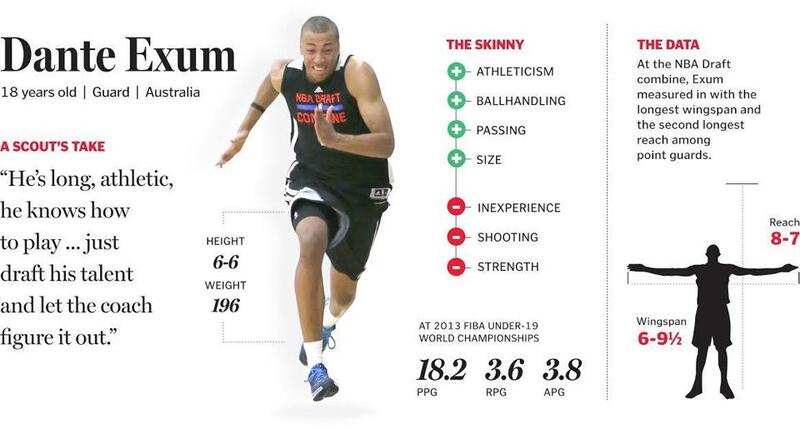 Yet NBA fans will know his name soon enough; Exum is expected by some to be a top-five pick in the June 26 draft. The son of Cecil Exum, a reserve guard at North Carolina in the 1980s, Dante Exum grew up in Australia after his father moved there to play professionally. Exum attended the highly regarded Australian Institute of Sport and then started traveling to compete in international tournaments, where word soon spread about his talents. But instead of opting for college, the 6-foot-6-inch Exum set his sights on the NBA. When he attended the Chicago combine in May, the 18-year-old Exum elected only to speak to reporters, avoiding the on-court drills, which only deepened the mystery surrounding his game. The biggest question about Exum is what position he’ll play in the NBA. “He’s intriguing in that he’s kind of like the new-wave point guard, a guy that can play both guard positions,” said one Eastern Conference executive. “He’s got great size — enough to play both guard positions — speed and athleticism and ballhandling to play the point and then shooting, size, and strength to play the [shooting] guard position. “He’s kind of the optimal point guard guy. I think that’s what’s intriguing about him. “You’re talking about the kid who, [at] the under-19 World Championships, was the best kid in the tournament, hands down. It’s just a matter of how many people saw him there and how many people are comfortable with that to make a decision on him. Another Eastern Conference scout said Exum might have to play point guard even if it’s not the best position for him. “As a point guard, I like him, but I don’t know if he’s a natural point guard,” the scout said. “I think that you kind of have to play him there — this is only based off me seeing him at Nike Hoops Summit last year — but the thing about him when he wasn’t playing point, because he was paired up with Dennis Schroder, was Exum had no clue how to cut or move without the ball. He just literally stood in the corner. A Western Conference scout recalled watching Exum face Schroder, a German point guard who was drafted by the Atlanta Hawks last year. The Western Conference scout called Exum a “very good prospect” but stopped short of saying he was anything more. “Again, is he not a tremendous prospect? I’m not going to say that,” the scout said. “Is he a potential All-Star? I don’t know. Is he someone who if I was drafting, and I haven’t seen him play other than a one-on-zero workout, would I consider drafting him top five? No [expletive] way. Exum hasn’t been playing on a competitive team since leading Lake Ginninderra Secondary College to the Australian National High School Basketball Championships title in January. Before that, he competed in the FIBA Under-19 World Championships, where he averaged 18.2 points, 3.6 rebounds, and 3.8 assists. But another Eastern Conference executive who watched Exum compete overseas said Exum reminded him of an Argentine player, San Antonio Spurs guard Manu Ginobili. “Just like Manu is extremely left-hand dominant, Dante is extremely right-hand dominant,” the executive said. “He really has no left hand right now. That will have to come as he gets older and stronger and just better as a player. That was kind of a name that came to mind. “I think it’s kind of an interesting type of player. I don’t think Manu gets enough credit for as good of a 2-guard as he actually is. If you can find another one of him, I think that’s a pretty good get. More than with any other lottery-caliber players, there are questions about Exum’s game, if only because of where he’s from. “He’s long, athletic, he knows how to play,” an Eastern Conference scout said. “I think his biggest thing will be getting stronger and shooting. I think he’s athletic, but it’s interesting, because he covered [Andrew] Wiggins a couple times at that [Hoops Summit] event, and he did OK.
“And it’s like, ‘OK, this guy can cover Wiggins.’ But then there are plays, and it’s like, as athletic as Exum is, he’s not an elite athlete. Wiggins can do this to a lot of people, but there was a very large difference between the two when it came to the level of athleticism.